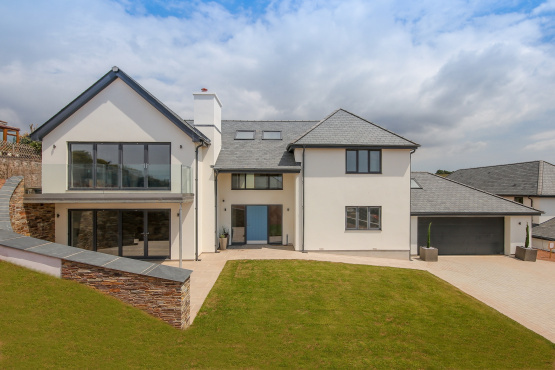 Leading South Hams’ Estate Agent Marchand Petit and Global property consultancy Knight Frank on behalf of Ironoak Developments Ltd. have launched Trenemans, a development of eight substantial detached houses on a stretch of unspoilt Devon coastline in Thurlestone. In tribute to its historic heritage and location, “Trenemans” takes the family name of the farmer who originally owned the land. Sitting in an elevated position on the coastline, each of the 4-5 bedroom homes has a unique architectural design. Internally, the houses have a contemporary, open-plan style layout with Italian designed kitchens, triple glazing and the latest eco-efficient heating system. With some homes boasting Juliette balconies, bi-folding doors and floor-to-ceiling windows, future residents will be able to enjoy outstanding vistas across the countryside and out to sea. William Hood, Director of Ironoak Developments commented, “We are delighted to be developing a unique site in Thurlestone in such a wonderful location on the edge of the village. Our design and build teams have worked incredibly hard to produce eight individually designed homes that maximise their locations and views. Combining this with highest quality materials and the latest heating technologies & insulation means we have delivered amazing homes for people to enjoy the great living Thurlestone has to offer”. The surrounding region has a diverse selection of excellent restaurants and amenities. Sailors, golfers, walkers, cyclists and horse riders are all well catered for and a few miles inland are the world famous open spaces of the Dartmoor National Park. The historic maritime city of Plymouth is about a half an hour drive, with the ancient cathedral city of Exeter with its international airport just over an hour’s drive away. The show home at Trenemans will launch Saturday 4th August, with prices at the scheme starting from £1.1m. For further information, please contact Marchand Petit ‘s Salcombe office on 01548 844473 or email: salcombe@marchandpetit.co.uk. We’d be delighted to see you on Saturday 4th August, between 11am and 1pm, at Trenemans, Thurlestone, Devon, TQ7 3EP.